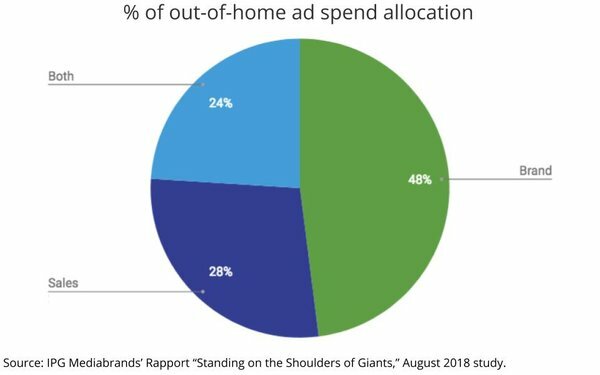 Brands that allocate 15% or more of their ad budgets to out-of-home media generate significantly greater levels of brand “uplift” from social media, finds a new study published today by IPG Mediabrands' out-of-home media shop, Rapport. The study, "Standing On The Shoulders of Giants," which is an international update on a U.K.-only version published in January, draws on 171 case studies of effectiveness advertising and marketing campaigns from the U.K.’s IPA (Institute of Practitioners in Advertising) Effectiveness Awards Databank, including OOH “power users” from five nations -- the U.K., Germany, China, Australia and Malaysia -- to understand how it impacts brand and sales lift, as well as the impact of other media. The report also found OOH power users generate greater long-term returns from their use of social media increasing market share and customer loyalty by 275%.